In his public lecture at City, Technical University of Berlin Professor Jorg Steinbach will explore the role of Engineering Research & Development (R&D) in influencing the development of society. On 27th November, the President of the Technical University of Berlin, Professor Jorg Steinbach, will give a lecture titled "Engineering: Interaction of R&D with Societal Development" at City University London. Internet technology which was in its infancy 15 years ago, has now become an inescapable aspect of our professional and private lives. The torrential speed at which this information is disseminated is largely taken for granted. However, our quality of life at both individual and community levels has been transformed by the presence of the Internet and the World Wide Web. Professor Steinbach is a chemical engineer. 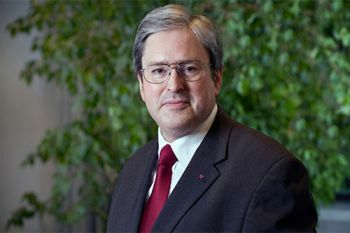 He has been the President of the Technical University of Berlin since April 2010. He will be receiving an Honorary Doctorate of Science (DSc) degree from City in January 2014, in recognition of the outstanding level of distinction he has achieved in his career within industry and in academia. The lecture will supply evidence for Professor Steinbach's proposition that Research & Development (R&D) pursued by natural scientists and engineers meaningfully impacts societal development. He will also demonstrate that technological development and lifestyle are inter-related as both domains interact dynamically with each other. The nexus between technology and society has consequences for the way young engineers are trained for the future and will require leaders of Higher Education institutions to think about ways in which this can be communicated to their students. This, in turn, will impact the professional accountability of all engineers. Professor Steinbach also holds the position that the connection between technology and society will have ramifications for the specific consequences of chemical process safety research and the public understanding of heavy engineering industries across the European Union. "I am delighted that Professor Steinbach, one of the leaders of the World Cities World Class (WC2) University network, is coming to City to deliver a public lecture on this very important topic. I wish to congratulate him in advance for becoming a recipient, in January 2014, of an Honorary Doctorate of Science from our University in recognition of his contributions to science, engineering and technology and his leading role in the establishment of the WC2 University Network". Please visit this link for more information about the lecture.